I know I said I'd have the GenBeauty recap up on the blog today, but after painting my nails with this nail polish over the weekend, I knew I had to do a Manicure Monday. 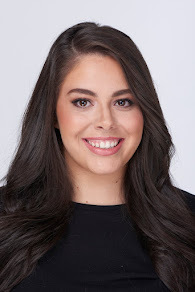 Kendra Scott is a well known, high end jewelry brand that is very popular amongst bloggers -- that's how I found out about it, at least. I have a few pieces of her jewelry and it's definitely high quality, and I really love the items I have. That's why when I saw that she released nail polishes, I was highly intrigued. I will admit, it was a little odd to me that a jewelry brand was coming out with nail polishes but when you think about it, it makes sense. We were jewelry on our hands, so wouldn't a jewelry company want to make your hands & look beautiful? Well, Kendra Scott is doing just that and I kind of love it. All of the colors in the collection are truly gem inspired. You could tell just by looking at the soft, sparkly colors that they were jewelry inspired. 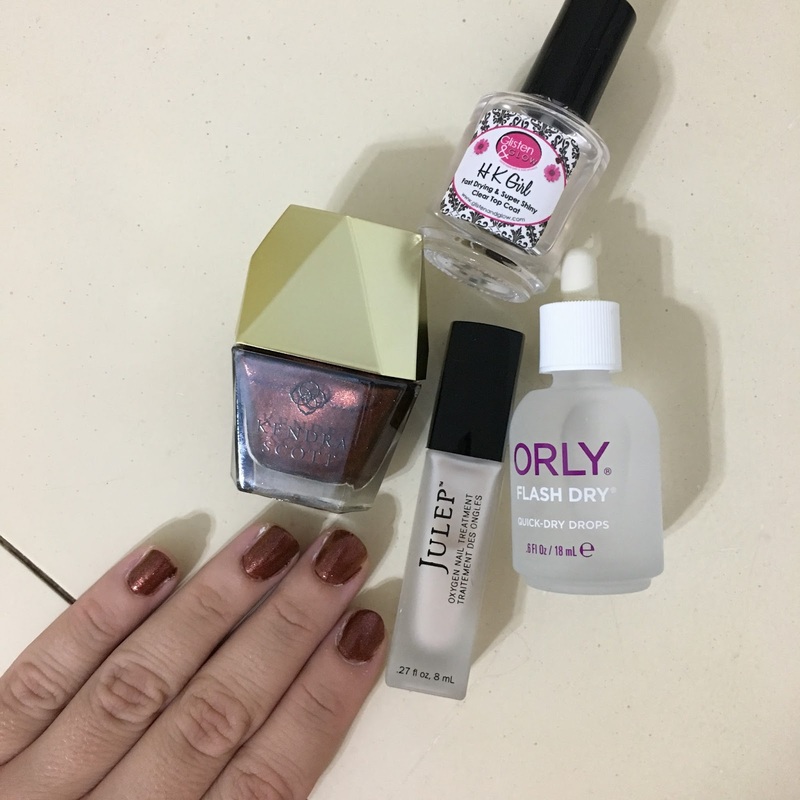 The nail lacquer is 5 free, and not tested on animals. The formula is super smooth, easy to apply, and not patchy at all. 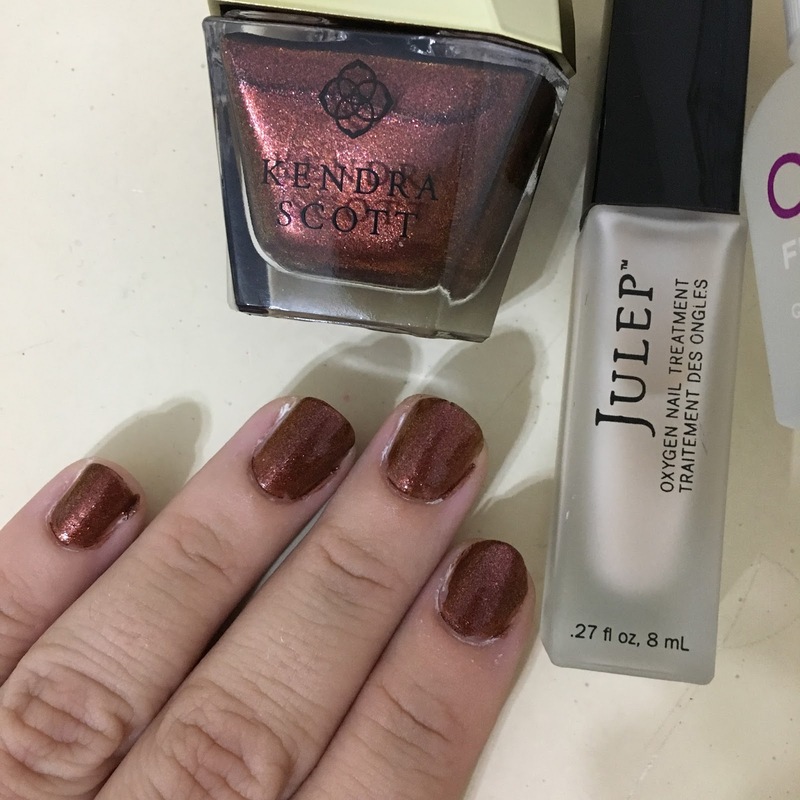 It's definitely up there with my Smith & Cult polishes. 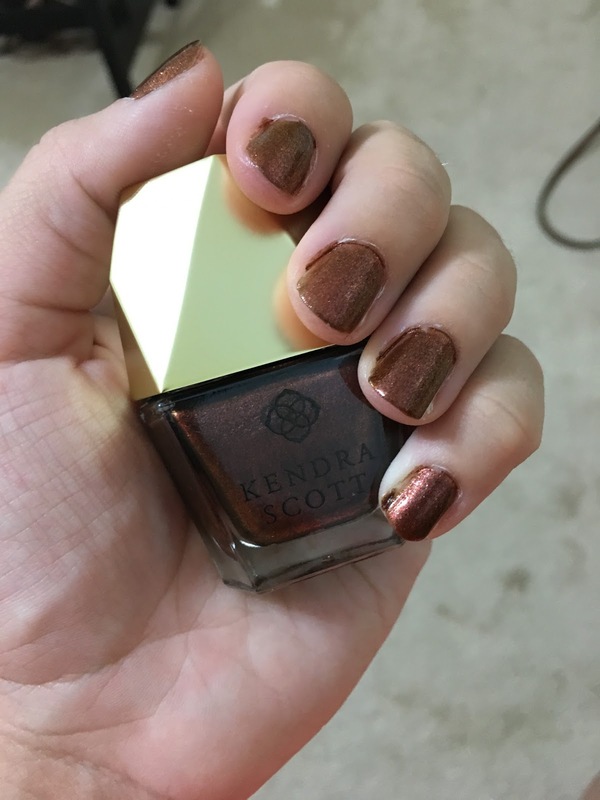 The color I have is called "Goldstone" and it doesn't seem to be available on the website right now, but its a gorgeous bronze color that is similar to Essie's "Leggy Legend". It has already chipped on me but I don't think my nails hold polish that well anyways. Even if that is the case, I'll continue to use this polish anyway because the formula is A+ and the color is stunning. I will say, I don't think I'll be buying any more Kendra Scott polishes for the sole reason that they're expensive, and you need to pay shipping. To me, I'd rather go to my local drugstore and buy Essie. Have you tried Kendra Scott polishes?